Mr. Lyons was one of the nine founding partners of Hanna, Campbell and Powell. He was licensed to practice law in 1982. 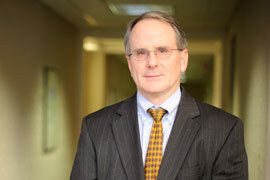 Mr. Lyons is a lead attorney in HCP's product and general liability group. His practice areas include personal injury defense, toxic tort defense, product liability, professional liability, commercial litigation, and insurance litigation. Mr. Lyons has been lead counsel in approximately 100 trials and has been involved in the defense of toxic tort matters across the country. As a result of his trial practice, Mr. Lyons has extensive experience in state and federal appellate courts. PNH, Inc. v. Alfa Laval Flow, Inc., 130 Ohio St.3d 278 is a case which Mr. Lyons successfully argued before the Ohio Supreme Court.